Tickets are available for the Academy's Memorial Day Picnic and Season Preview on Monday, May 29 in Gilbert, Arizona. Indoor performances by each section of the corps and the organization's youth color guard will be followed by a full ensemble performance of the corps' 2017 production. The $5 admission includes lunch. Volunteers are needed to help prepare meals for Blue Knights' upcoming all-day rehearsal camps. High school students will learn about leadership, wind musicianship, and percussion at the Blue Stars Experience Clinic July 3 at Minnesota State University in Mankato. The Bluecoats were busy #movingINBLUE this week. See what the corps members were up to in their first few days of its spring training rehearsals. The Cadets profile ttheir new chef Chris Noble, an alum who in a long career in the culinary arts has been fortunate to work with the culinary teams of Ruth's Chris, Guy Fieri, and Giada Dilaurentis. Contributors to Carolina Crown's CrownJEWELS Campaign are offered a number of special incentives, depending on their membership level. Crossmen has announced a variety of Marching Music eXtravaganza Events, specializing in training student leaders and drum majors. In addition, an eXperience Day is open to all middle school and high school students, offering an opportunity to rehearse and perform alongside members of the corps. Genesis announced the title of its 2017 production, “The Other Side of Now,” based on concerns for how the subjects of music, art, and creative literature are being stripped from school curriculums across the country. Guardians has a number of paid positions open in summer food service and transportation. Jersey Surf's 2017 production is titled, “Make It Our Own,” a journey of transformation out of the everyday mundane that will feature music by Snarky Puppy and Sia among others. Volunteers are needed for Legends' food booth at the Grand Rapids Festival of the Arts June 1-4 in Michigan. The annual event features deep-fried Oreos, deep-friend pickles, and other goodies. Louisiana Stars has openings for a few more color guard performers. Madison Scouts needs food service volunteers during its June spring training dates. Volunteers will be allowed to eat all the corn dogs they wish. Music City will host the first annual Drums Along the Smokies Open Class DCI Tour event in Knoxville, Tennessee on July 19. Oregon Crusaders has three paid food service positions available for the summer. There is still time to sign up for Phantom Regiment's educational summer camps for brass, percussion, color guard, and drum majors. Sessions will be held in multiple locations including Rockford University, University of Akron, University of Central Arkansas, and Frostburg State University. Pioneer has openings in its 2017 corps for one mellophone and one baritone player. “Ouroboros” is the title of Santa Clara Vanguard's 2017 50th anniversary production, referencing the act of something constantly reinventing itself. Seattle Cascades has a new food truck fundraiser through Perfectly Posh, a purveyor of high-end body care products. 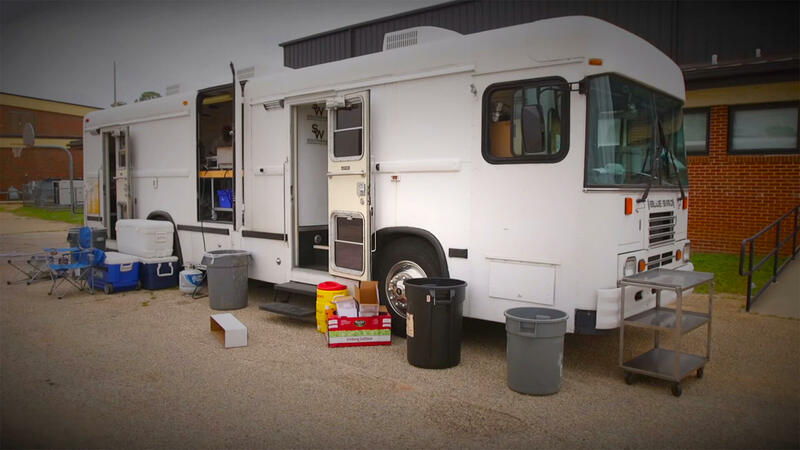 Southwind has posted a video on how a former bookmobile has been transformed into the corps' mobile kitchen. Attendees at Spirit of Atlanta's three-day Spirit U camp for students ages 12-20 will learn how to grow their skills in marching music performance, fitness and leadership. Also offered are classes for directors and band boosters.